Slack has had a special relationship with Japan and its business community since long before we made our product available in Japanese two years ago. Work-style reform throughout the Japanese workforce is improving companies’ work-life balance, efficiency and collaboration, and organizations from large, established businesses to start-ups to educational organizations are using Slack to help advance this transformation. This month we reached a big milestone in our relationship with Japan by opening a new office in Otemachi, Tokyo, designed by Suppose Design Office to embody Slack’s role as an efficient, transparent communication space. As Slack is a digital hub for collaboration, the office is a physical one, with spaces that not only connect to increase visibility and productivity among functions but that allow Slack’s employees, our customers and partners to work together. 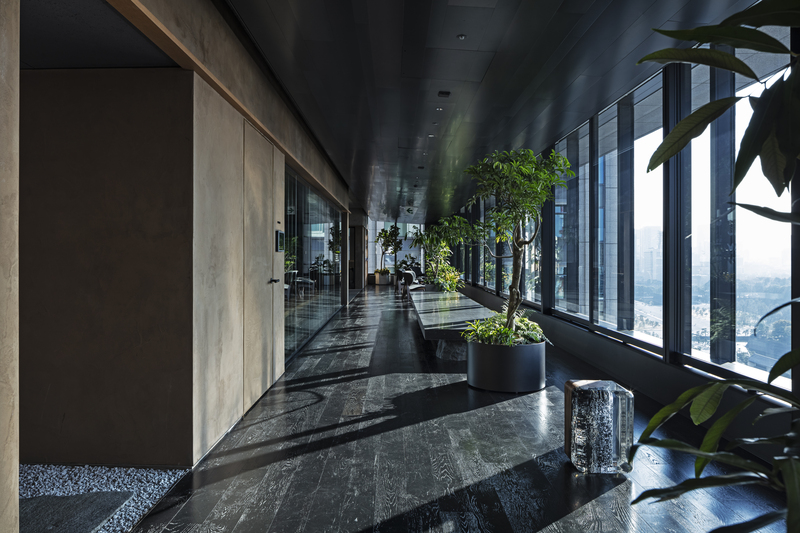 The central axis of the office space is the Engawa, a zone used in traditional Japanese architecture to connect building interiors with the natural landscape. The Engawa spans the area along the office’s west-facing windows, and the different functional spaces—cafeteria, meeting rooms and so on—are situated along the Engawa. 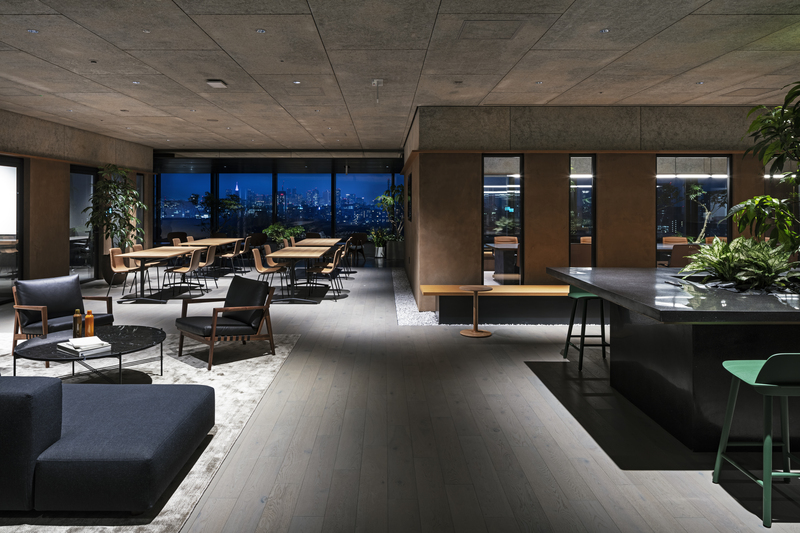 The Engawa that connects diverse workspaces in Slack’s new Tokyo office. In addition to the in-house workspaces, the new office features a Guest Area: a coworking space for customers and partners to work with Slack employees. The Engawa connects these two zones, both symbolizing our deepening relationship with Japanese businesses and facilitating our real-world collaboration with them. The Guest Area, a coworking space for Slack employees, customers and partners. The new office space was inspired by Slack’s Japanese customers, which include Bandai Namco Studios, Mercari, Musashi, Nikkei, SoftBank and Yahoo! Japan, and their commitment to improving communication, efficiency and culture in their organizations and the nation’s workplaces as a whole. At the office opening on April 9, Slack announced and celebrated two new customers in the field of education, Kindai University and N High School. One of Japan’s largest universities and guided by a principle of practical education, Kindai University is home to world-class institutes like the Aquaculture Research Institute and the Research Institute of Bio-Coke, which is developing a next-generation bio-renewable fuel. The university has expanded its use of Slack to staff at all of its campuses and locations in order to increase visibility across functions and manage large-scale, cross-departmental projects. N High School offers students a flexible online learning environment that minimizes the time and location constraints of a physical classroom. Since the school was founded in 2016, teachers, students and staff have been using Slack to connect students around activities and study groups; improve anytime, anywhere communication between students and educators; and streamline work among staff. We’re grateful to work with these institutions and others across Japan to help develop new approaches to education and collaboration. So thank you, Tokyo, and all of Japan, for welcoming Slack and partnering with us to help transform your organizations. We’re honored to work together in our new home.